Web handling machinery is on the critical path for many continuous process lines. 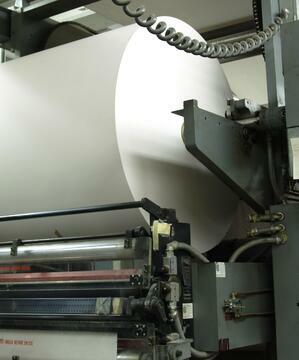 Paper, metals, textiles, rubber, film, printed media, flexible packaging, and building materials are a few of the product classes that rely on such capital intensive equipment. Faster throughput, higher quality, and more uptime are the mantras heard on these production floors every day. One key element in maximizing these parameters is proper machine alignment. 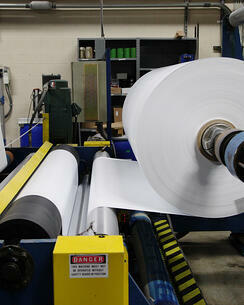 These machines have many interrelated components. For a web to run trouble-free, the critical geometric relationships between them must be set correctly. Misaligned equipment leaves your business vulnerable to a host of issues ranging from damaged product to equipment breakdowns. The cost of lost production associated with such interruptions can be enormous. Whether you have a new installation, are troubleshooting a pesky machine section, or need ongoing maintenance to optimize your machine’s performance, we can help. The optical instruments we employ are ideally suited for this environment, having measurement accuracies of ±0.001 inch per 17 feet. We can inspect, evaluate and adjust components in hard-to-reach places over the entire line. We have the technology and experience to manage the complex geometric relationships in your process machinery. An initial survey is performed to determine the current condition of the machine. In this process, an offset machine centerline is set on the tending side to provide an alignment reference for the entire line. The offset line may be set permanently with embedded floor monuments or temporarily with adhesive targets, depending on future requirements. A precision optical instrument (a jig transit) is aligned with the offset centerline. A second jig transit then turns a precise 90° angle relative to that offset centerline and “looks” inside the machine to measure the desired component. Measurements on both the tending and drive sides qualify the component’s horizontal profile. An elevation profile is conducted with a precision sight level on both tending and drive sides. Together, the horizontal and elevation profiles provide the necessary control for many machine features. Sometimes a third dimension is required to accurately center a machine section. A printing press, for example, often needs this additional control. 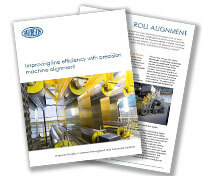 Maintaining any continuous process line requires precision machine alignment. They simply will not run well without it. So it’s not a surprise when our customers tell us that our alignment services provide great value, often paying for themselves within days and weeks, not months or years, with the cost savings continuing to grow after that. Contact us to learn how precision machine alignment can improve your bottom line…or schedule an on-site visit to get your equipment running at peak performance. Learn how precision optical alignment can help increase profits for your facility.